Our family moved to San DIego in February of 1972. If you moved here after 1981, it would be hard for you to realize what University City really looked like in 1972. Standley Park did not exist, nor did Standley Junior High, Swanson Pool, or University City High School. All of that came later, as the community came together to make these things come true. 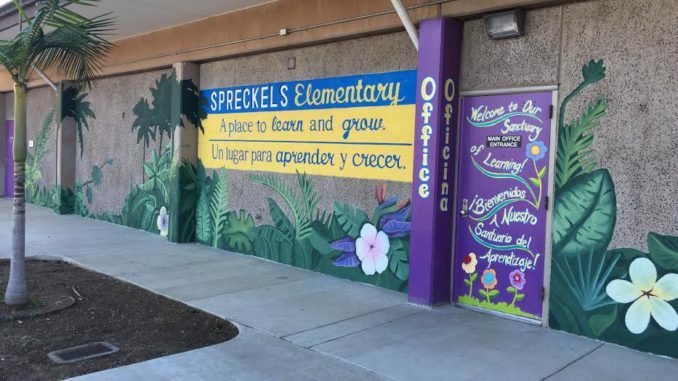 What did exist at the time was Spreckels Elementary school. It was a sorry looking double row of shabby wooden portable bungalows, lined up against the fence of the neighbors on Stadium Ct. There was only a dirt lot for a playground and no lunch court, and no air conditioning. The teacher’s “lounge” was also housed in a wooden bungalow, with no bathroom. The neighbors on Stadium Court complained constantly about the noise from the school. I was the Chair of the newly formed Citizens Advisory Committee when the Teacher’s Union called a strike in the 70s. What we learned from that experience was that teacher morale at our site was very low, due in part to the conditions under which they were forced to work. After listening to the teachers at our site, and after the strike was settled, I and Martha Cox, another parent volunteer, decided we had to do SOMETHING about the deplorable conditions at Spreckels. We decided that we needed a new permanent facility at Spreckels, and to that end we started writing letters to the Superintendent, Tom Goodman, to the School Board, and to our Board member, John Witt. When that did not produce results, Martha and I decided we would go the School Board meeting and make a presentation. We had our facts and figures, pictures of the sorry-looking site, the dust covering everything when the wind blew. We got nowhere. We were told there was no money for a new school. But, we were now angry, and made the decision to attend every weekly school board meeting for the entire school year, and speak to the Board during the public comments period. This went on every week for three months. Martha and I attended and spoke at every scheduled school board meeting. At end of three months, we got the news we wanted. The School District had somehow received federal money, and our new school would be built. We broke ground in the Spring of 1977, Martha and I digging ceremonial shovels of dirt. It was a great day. The school you see there today is the result. It opened in 1978 and has been a big part of our community ever since. By the time it opened, Martha Cox and family had moved away. My own children never attended the new school. The two older children were now in Junior High, and my youngest attended a Magnet School for 6th grade.